I’m not one for being in touch with your emotions. Or at least that was what I told myself. Apparently I’ve been fooling myself. In a big way. You could blame it on hormones, über sensitivity, the moon, the sun, the tide, but that doesn’t change anything. I am an emotional person. Shocking. A friend and I used to joke that I was dead inside. Apparently not true, emotionally stunted, often situationally awkward, yes. Dead on the inside, most definitely not. It’s somewhat of a relief. I was starting to worry something was wrong with me. Ok, there are plenty of things wrong with me, but dead on the inside is not one. It’s not like I was really dead on the inside, my emotions were just buried pretty deep. Of course that’s all changed now. I’ve been peeling back the layers. Sometimes these emotions are a bit embarrassing – audience or not. For example, just the other day I was watching Princess Diaries 2. Stay with me. There’s a part in the movie during a parade where Mia spies a sad little girl being picked on by some older boys. She stops the parade walks over to defend the little girl (in a very sweet and non-confrontational manner). Turns out the little girl is an orphan. Mia gives all the orphan girls tiaras and tells them they are all princesses. She then invites them to join the parade. You have to believe you’re a princess. Cue the music. I’ll spread my wings and learn how to fly…. Tears. Seriously? What is wrong with me? Next thing you know I’ll start tearing up during soccer commercials. Oops, too late. 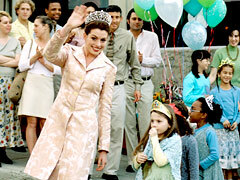 This entry was posted in Just because, Life Lesson and tagged Crying, princess diaries 2. Bookmark the permalink.